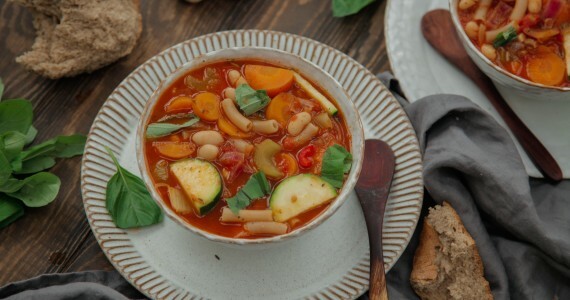 This simple minestrone soup is the perfect winter warmer. Full of flavour, easy to prepare and ideal for a cosy night in! 1) Start by heating some oil in a pan. Add the onion and garlic and cook for a few minutes, stirring often, until the onion has softened. Add the vegetables - apart from the courgette - and cook for five minutes. 2) Stir in the tomato puree and oregano, then add the chopped tomatoes and stock. Bring to the boil, then reduce to a simmer and cook for ten minutes. 3) Add in the pasta, beans and courgette and cook until the pasta has cooked through. Season to taste, then stir through the fresh basil. 4) Serve in bowls with fresh sourdough, a squeeze of lemon and more basil leaves.